There is an association between J Garner and Son to the poet William Cowper. 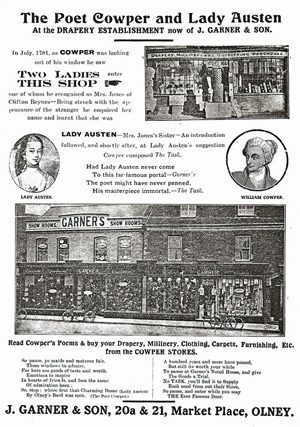 The first sighting by Cowper of Lady Austen occurred outside No:21 Market Place which later became Garner’s shop window. During the close friendship between Lady Austen and William Cowper, she is attributed to persuading him to compose his ‘immortal masterpiece’ ‘The Task’ and also ‘John Gilpin’. 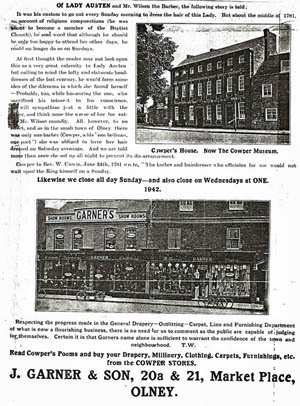 This connection is shown below of an old photograph reproduced in a local newspaper (but much later than 1925 ), and also through two advertising sheets used by J Garner and Son during the 1940s. Miss Phyliss Hipwell left, daughter of J C Hipwell, dressed as Lady Austen and Ivy Watson, daughter of William Watson, the painter and decorator who lived in the house on the corner of Lime Street and Weston Road, as her sister, Mrs Jones. 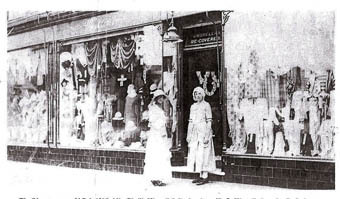 Behind them is the drapery business of Joseph Garner, described in a 1907 almanac as ‘the longest shop front in Olney’. It was to these premises, with an earlier shop window, that the two ladies came in July 1871 and were espied by the poet from his windows opposite; they became firm friends and at Lady Austen’s suggestion, William Cowper composed ‘The Task’. The source and date of this newspaper cutting is unknown. In July, 1781, as Cowper was looking out of his window he saw two ladies enter this shop one of whom he recognised as Mrs Jones of Clifton Reynes – Being struck with the appearance of the stranger he enquired her name and learnt that she was Lady Austen – Mrs Jones’s sister – An introduction followed, and shortly after, at Lady Austen’s suggestion Cowper composed The Task. His masterpiece immortal. – The Task. By Olney’s Bard was seen. This story is creditable not only to Cowper and the Customer but also to the Draper. Like the Draper in Cowper’s day J Garner & Son do their best to oblige. In fact their sole aim is to please. * Handkerchiefs in those days were woven different sizes in pieces of 12 yards, hence each one had to be cut according to size required, the raw edges usually being hemmed by the purchaser. 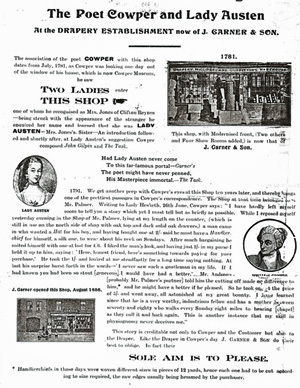 The association of the poet Cowper with this shop dates from July 1781, as Cowper was looking one day out of his house , which is now the Cowper Museum, he saw two ladies enter this shop (see the 1781 illustration), one of whom he recognised as Mrs Jones of Clifton Reynes. Being struck with the appearance of the stranger he enquired her name and learned that she was Lady Austen, Mrs Jones’s sister. An introduction followed and shortly after, at Lady Austen’s suggestion Cowper composed ‘John Gilpin’ and ‘The Task’. We get another peep with Cowper’s eyes at this shop ten years later (1791), and thereby hangs one of the prettiest passages in Cowper’s correspondence. The shop at that time belonged to a Mr Palmer. Writing to Lady Hesketh, 26th June, Cowper says: “I have hardly left myself yesterday evening in the shop of Mr Palmer, lying at my length on the counter, (which is still in use on the north side of the shop with oak top and dark solid oak drawers,) a man came in who wanted a Hat for his boy, and having bought one at 2/- said he must have a Handkerchief for himself, a silk one, to wear about his neck on Sundays. After much bargaining he suited himself with one at last for 4/6. I liked the man’s look, and having just 1/- in my purse I held it up to him saying, saying: “here, honest friend, here’s something towards paying for your purchase”. He took the 1/- and looked at me steadfastly for a long time and said nothing. At last his surprise burst forth in the words “I never saw such a gentleman in my life. If I had known you had been so stout [generous] I would have had a better”. Mr Andrews [probably Mr Palmer’s partner] told him the cutting off made no difference to him ,* and he might have been a better if he pleased. So he took one at the price of 5/- and went away, all astonished at my great bounty. I have learned since that he is a worthy, industrious fellow and has a mother between seventy and eighty who walks every Sunday eight miles to hearing [chapel] as they call it and back again. This is another instance that my skill in physiognomy never deceives me”. – and also close on Wednesdays at ONE. It was his custom to go out every Sunday morning to dress the hair of this Lady. But about the middle of 1781, on account of religious compunctions (he was about to become a member of the Baptist Church), he sent word that although he should be only too happy to attend her other days, he could no longer do so on Sundays. At first thought the reader may not look upon this as a great calamity to Lady Austen but calling to mind the lofty and elaborate head dresses of the last century, he would form some idea of the of the dilemma in which she found herself. Probably, too, while honouring the one, who sacrificed his interest to his conscience, he will sympathise just a little with the other, and think none the worse of her for rattling Mr Wilson roundly. All, however, to no effect, and as in the small town of Olney there was only one barber (Cowper adds “one bellman, one poet”), she was obliged to have her hair dressed on Saturday evenings. And we are told more than once she sat up all night to prevent its disarrangement. Cowper to Rev. W Unwin, 24th June 1781 wrote, “The barber and hairdresser who officiates for me would not wait upon the King himself on a Sunday”. Mr Garner’s keen interest in the Cowper & Newton Museum is well known . 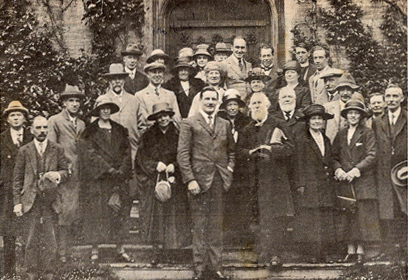 The photograph below, reprinted in the Bucks Standard on 15th November 1968 shows Mr Garner as a Trustee of the Museum visiting Castle Ashby on 23rd May 1924. This picture was taken at Castle Ashby after a meeting and tea with the Marquis of Northampton on 23rd May 1924. The white bearded gentleman is Mr Thomas Wright, the well known Olney writer and school master, and next to him is the Marquis. Mr J J Garner is on the extreme right. Should you have any comments on this article, please contact us at information@olneyhistory.org.uk.